Paramount is launching a new kind of entertainment experience. Or rather, the same kind of experience, just via a virtual reality (VR) headset. While mobile augmented reality (AR) is seen as the most likely of Immersive Media Experiences (IME) to take off in the near term, VR continues to be the IME that generates the most buzz. That's because it promises experiences that are richer and more immersive than any other form of gaming or video entertainment so far. Paramount Pictures Corp. has decided to try and replicate the in-theater experience through VR headsets. It's working with VR vendor Bigscreen VR. 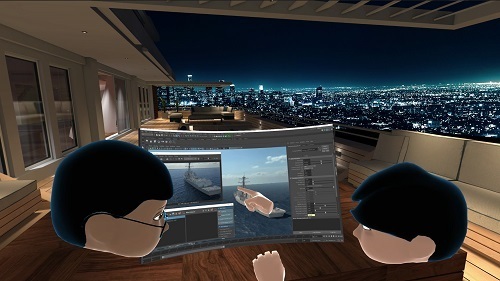 The Andreessen Horowitz-funded VR app provider has been aimed more at VR applications for enterprise productivity, describing itself as an immersive, social computing experience that lets you use your computer in VR. The initial goal was to share computer screens in a more immersive, bigger way to facilitate collaboration at work and social interactions. However, in July this year, Bigscreen launched its "Cinema Update," adding a virtual IMAX-like theatrical experience to the app. Users can watch movies on the virtual large screen as well as play games and share productive tasks. It supports video streaming at 1080p at 30 frames per second (fps) and native audio streaming in stereo. The update also includes a new engine built in C++ aimed at reducing processing and memory requirements. Some, such as former Paramount executive Teddy Zee, have already predicted the eventual demise of the movie theater. "Hollywood [in the past] focused on the theatrical release. So it's trying to protect it. They find it very scary that people can now just skip their traditional channel where they have spent decades building up a strong position." Users of the Paramount app put on the headset, launch the app and then "walk" into a virtual movie theater, find their seat and even talk to the people sitting next to them. The virtual theater features a massive IMAX-style screen, just like a regular theater. The app can also support other extras, like trailers and bonus content such as Q&A sessions with the filmmakers, games and trivia, some of which may not even be possible in the real-world. Paramount is partnering with various other VR technology companies as well, including Microsoft, Oculus, Samsung, HTC and others. It launches December 3 and is supported by most headset brands (Oculus Rift, HTC Vive, Fove, Pimax and WindowsMR headsets from Dell, Acer, Lenovo, HP and Samsung, according to Bigscreen). By signing on via the Bigscreen website, users can experience Top Gun 3D for free. But Paramount's experiment is probably the most significant. If the studio finds the experience satisfactory, it could be the beginning of the end of the movie theater. Theater owners have already been scrambling to find new ways to generate revenue, but if the at-home VR movie experience matches -- or is superior to -- the theatrical experience, that could kill off the industry. And while bandwidth requirements will still be significant, the nature of this experience is still limited to a single point-of-view, which significantly lowers the video bandwidth requirements compared to a fully immersive 6DoF experience. Fortunately for theater owners, headsets are still expensive and heavy, and penetration is still limited to single digits even in advanced markets. So there's time to adapt. But as Teddy Zee says, "I've seen the future, and if someone my age can see the advantages, imagine what it can do to an 18-year-old."